Eritrea nationalized land in 1994 under the proclamation of NO. 58/1994. 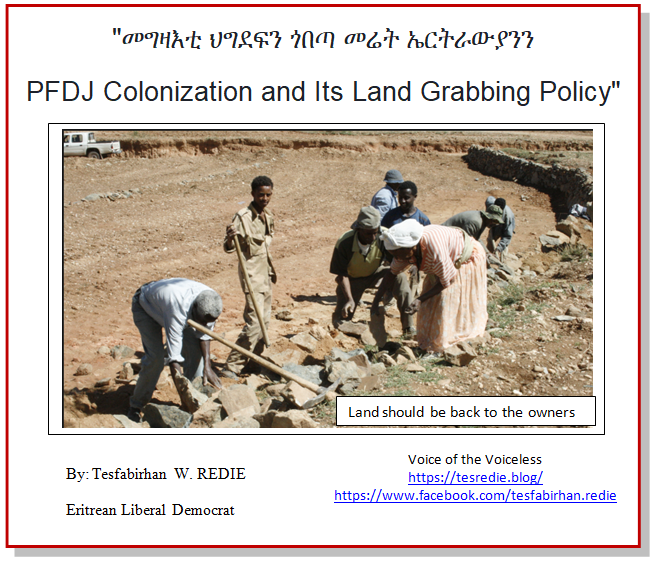 This nationalizing policy of land has left Eritreans without any property that they can claim for. 30 years war against Ethiopian invasion was replaced by another home grown land grabber. This policy is unfair and against the aspiration of the 30 years war who was truimphed by the popular participation of the farmers. Farmers joined the armed struggle thinking that they will be free to plaugh their land and be the sole owners of their property. Finally, the out come is a disaster. As a liberal democrat, I am advocating for the land to return back to the owners without delay. And the government to assist any disputes that may occur during the transition period by introducing proper reconciliation and compensation strategies that will settle the disruption which have occured by this wrong policy. Here is my extended Tigrigna version of my criticism to the Land Reform POliciy of 1994. and any other procalations related then after. Proclamation No. 58/1994: A Proclamation to reform the system of the Land Tenure System in Eritrea, to determine the manner of expropriating land for purpose of development and national reconstruction, and to Determine the powers and duties of the land Commission. The Language Of Land Grabbers!